This week's colors are Bashful Blue, Pumpkin Pie and Apricot Appeal. I decided to go to my catalog and go to a random page again! This time I opened to page 59 and used the Simply Said card as my inspiration. I do have the Simply Said set but decided to use my Fall Flair set instead. I even had some of the materials I needed right out on my desk. First I took a piece of Shimmery White card stock. It happened to be out on my desk and was cut at 4 1/4 x 11". So I went with that and folded it in half. So this card opens on the left side. I ripped the bottom and add a 1" strip on Pumpkin Pie CS on the bottom. 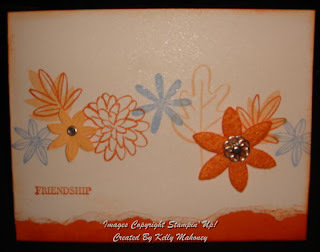 I stamped my flowers in Pumpkin Pie, Apricot Appeal and Bashful Blue. Then, I added the Flower Fusion Pumpkin Pie flower with a Filigree brad. 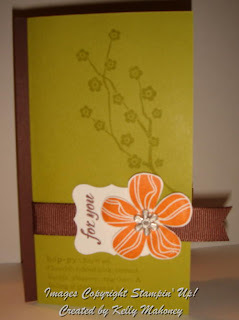 I stamped one of the flowers with Apricot Appeal on Apricot Appeal CS. I cut it out and added an Ice Rhinestone Blue Brad. Both of the flowers are attached to the card with Dimensionals. Finally, I sponged around the entire card with Pumpkin Pie ink to soften it a little. This week's Color Challenge was to use Always Artichoke, Creamy Caramel and Regal Rose. I also decided to use Beate's new weekend sketch challenge. I started with a 5.5x11" piece of Alaways Artichoke folded in half. I stamped the edge of this with Artichoke ink and the outline Butterfly stamp from the set "Flight of the Butterfly" (#111564 $31.95). Next I cut a piece of Creamy Caramel at 4.75x4.75" and a piece of Regal Rose at 2x3.5". The regal rose piece was stamped with the flowery butterfly in Regal Rose ink. I only inked the flowers on this and not the body of the butterfly to create the background. I then stamped the base butterfly on a scrap of whisper white with creamey caramel. I did stamp off first. Then I used my stamp-a-ma-jig and stamped the outline butterfly with Artichoke ink and the stamp-a-ma-jig again for the flowers in regal rose ink. (Again, I did not ink the body for this step.) I cut out the butterfly and added some dimensionals to the back. This pic is kind of blury.... but you can see that I placed one dimensional in the middle and then doubled up the dimensionals under the wings of the butterfly to give it some extra dimension. Finally, I stamped the sentiment with Artichoke ink on the caramel square, stamped the small buterfly with caramel ink across the bottom and assembled as shown. I hope you enjoy this card! I was really happy with how it came out!! Don't forget to check out the blogs of the other "Color Girls", listed on the right, for more inspiration!! So, the Demo in my group who posts the color challenge is Colleen. Well, at Fall Fest, the event I went to last weekend, she was asking people if we were one of the "color girls". Well, it kind of stuck. So I added the list of "Color Girls" to my side bar this way you can easily check out their blogs anytime and see their entries for the color challenges each week. As more girls join us in our challenges, I will add them to the list, too! Thanks Colleen for starting this challenge and for bringing us "color girls" together!! Upsy Daisy and a Color Challenge! Last night I had my Upsy Daisy Class. The ladies who attended really enjoyed the cards, so I thought I would share them with you! You have seen 2 of them previously, but ya know, it never hurts to show them again. The one on the top was inspired by a card I saw while browsing around. I will try to figure out who made it and let you know. To create the sunset look, I used my brayer and some sponges and sponge daubers. I started with Summer Sun ink, then went on to Tangerine Tango followed by Red Riding Hood Red and finally ended at the bottom with Chocolate Chip. I stamped the flowers with Basic Black. It takes some practice to get the brayer to add the color without getting too much of a straight line. That is where the sponges and such come in hady to blur that line if you need to. The card on the bottom, I made for this week's color challenge. The colors were: Tempting Turquoise, Green Galore, Ballet Blue and Brilliant Blue (or Pacific Point). Now I know you are saying, "ok, I see the other colors but where did you get in the Ballet Blue??" Relax.... Let me explain - no, no, there is too much- let me sum up!! (for all you Princess Bride fans out there.) 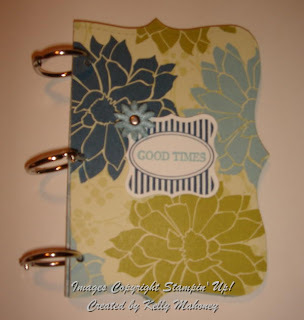 I stamped the flowers on the Turquoise CS in Ballet Blue first! Then, I stamped them again in Brilliant Blue. I got that shadowy look and got in all of the colors. BTW, this card was cased right from the "Never Before Seen Stamps" Promotion flyer!! 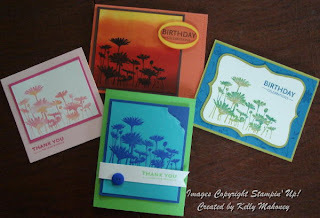 I love that Stampin' Up! always gives us great samples. Better than that, they even encourage us to copy them!! What could be easier? I hope you enjoyed these cards!! If you would like to order the kit for this class, please let me know. The kit is $25 plus $5 shipping. The kit includes all of the cs and embellishments needed to make these 4 cards. I will even stamp any images that are not included in the Upsy Daisy Set as that is part of the kit!! I will take orders until September 20th. I will then place the order for the stamp sets and have them shipped to you by 9/30. Well, we were asked to keep this under wraps until it was official........ (drum roll)....... Online ordering for Stampin' Up! has arrived. That is correct. There is no more waiting for me to have an order together. There is no more needing to call me to place your order (unless you still want to - I do love to chat!)....... You can now click right here and then click on the "Shop Now button in upper right hand corner. This will bring you right ot my online store and you can place a Stampin' Up! order anytime you want to!! Plus, you still get me! I will still be here to help you when your order comes in and will be happy to show you how to use a new product or help you get some new ideas. So check it out! Let me know what you think of this great new option! Plus, it is easier than ever to browse the catalog right there, too! So here is my version. I used the Urban Garden DSP. I also got to use my Curly Label punch bundle. The "Good Times" is from the Celebrate Everything set. I even got to add on of the Flowers from the new Flower Fusion set with a silver brad. OK.... I know haven't posted all week! The kids are finally going back to school and I am trying to get back into a schedule. I think my body is going into shock. Anyway, this week's color challenge was to use Chocolate Chip, Kiwi Kiss (or Old Olive), and Pumpkin Pie. Last night was the first chance I had to sit down and work on this. I also was feeling like I had no idea what I was going to do. So I decided to open the catalog to a random page and copy the layout of the card. I ended up opening to page 104 and decided on the middle card. I started with a 3 1/4 x 5 1/4" piece of Chocolate Chip CS for the back of my card. Then I cut a piece of 6" x 5 1/4" piece of Kiwi Kiss that I folded in half. I stamped the branch image from Eastern Blooms in Kiwiw Kiss ink on the top. Then the "Happy" definition from Define your Life on the bottom. 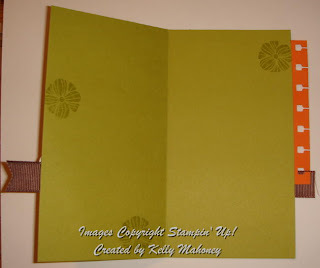 I stamped and cut out the flower in Pumpkin Pie ink on Whisper White CS. I also stamped the "For You" from Fresh Cuts in Chocolate Chip ink and punched it out with the Curly Label Punch. Next, I took a scrap piece of Pumpkin Pie CS and punched it with the spiral punch. I adhered this to the back of the Kiwi Kiss card so it sticks out the side. (You will see this in the bottom pic on the inside of the card.) I wrapped the 5/8" Chocolate Chip Grosgrain around the card and adhered it to the Chocolate chip backing. Finally, I attached the Label, added one of the new Flower Brads to the center of the flower and put that on the card with Dimensionals. I also stamped a few flowers on the inside of the card. And now a challenge for you... This card is definitely not somthing I would have ever considered designing. It is so out of the box for me. But it was fun picking a random card from the catalog and using it to create. So I challenge you to give it a try! !